This is one of the first recipes I shared here on From Scratch. Since we’re in full-on pumpkin season I thought I would share it again for those who may have missed it! Original post follows. I fell in love with pumpkin muffins in the late ’90s when I worked in the Factoria area of Bellevue. The Great Harvest Bread in Loehmann’s Plaza made these wonderful Pumpkin Hazelnut muffins that I used to buy when they were still warm. So delicious, and addictive! This Pumpkin-Apple Muffin recipe has been my go-to pumpkin muffin recipe for a long time now. I try to make it once every fall. I got the recipe from the Seattle Times years ago (at least 11 , since I haven’t lived in Seattle for 10 years now and I remember making these while I lived there). A note on the recipe says it was originally from “Colonial Homes Magazine”, which apparently is no longer published. Look! 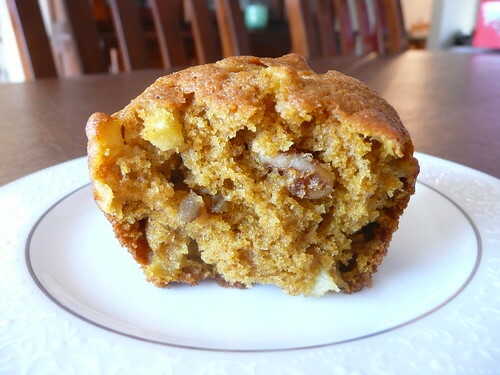 The recipe is still available on the Seattle Times web site: Pumpkin-Apple Muffins. I decided to try substituting white whole wheat flour for part of the all-purpose flour. The results were delicious, and the whole wheat adds a bit of extra nutrition. Preheat oven to 350°. Lightly grease muffin pan(s) or line with paper cups. In a large bowl, whisk together the flour, sugar, pumpkin pie spice, baking soda and salt. In a medium bowl, whisk together the eggs and oil until blended. Whisk in the pumpkin until smooth. Stir in the apples and walnuts. Add the pumpkin mixture to the flour mixture and stir until just moistened. Spoon into the prepared muffin tins, filling each cup about ¾ full. Bake for 30 – 40 minutes, or until a toothpick inserted into the center comes out clean. Turn out onto a wire rack and cool a bit before serving. Welcome to my first “results” post for my Bouchon Bakery Challenge! Did anyone else make the Banana Muffins? I have been thinking long and hard about whether or not to share the actual recipes each month, and I have decided against it. I don’t feel comfortable sharing recipes from newly-published books. Also, when I share recipes I like to paraphrase them a bit, and these recipes are so specific and verbose that I am sure I could not do them justice! If I make significant changes to a recipe, then I will share my modified version. I will always share any modifications for altitude, if I make any. If I find a recipe published somewhere else on the Web I will include a link to it. Now that we have that business out of the way, how were the muffins? I have to say, they were quite decadent and delicious. I *loved* the streusel topping! The crumb was very light and tender. These muffins are more “cake-like” than “quick bread-like”. I have a few minor quibbles with the recipe (actually the book in general). All the ingredients in the book are given in both weight and volume measurements. I actually love it when cookbooks do this because I have really grown to prefer weighing my ingredients when I bake. But many of the weights are given in tenths of a gram, and my scale is only precise to whole grams. My biggest quibble is when it comes to the eggs. Here is what the recipe says for the egg: “80 grams, or 1/4 cup + 1 tablespoon”. No indication of how many eggs that might be. Turns out to be about 1 and a third eggs. I get that the weight of the eggs is more precise, and that these recipes are scaled-down versions of the bakery recipes, but really! The authors suggest breaking the eggs into a bowl, lightly beating them, straining them, and then weighing the mixed egg . Then you end up with just a little bit of leftover egg. It made me long for the more pedestrian call for “1 large egg”. The recipe instructions are for 6 large muffins. I made 12 standard-sized muffins and baked them for roughly 28 minutes. The Walnut Streusel Topping recipes makes enough for 2 batches of muffins. Plan on having extra, or cut the recipe in half. The recipe states the muffins are best the day they are baked. While is it true they are *best* the day they are made, I still found them to be quite tasty after several days. I just reheated them in the oven for 5-8 minutes. When I adjust cake-like recipes for Reno’s altitude (~4500 feet) I usually add an extra egg or egg white. I was unsure how to proceed given the way eggs are measured in this recipe (see my rant above). I decided to see how much one egg + one egg white weighed. It came out to about 100 grams, 20 more grams than the recipe calls for. I went with it! I also usually adjust the amounts of baking soda and baking powder, but I forgot to this time. While my muffins were moist and delicious, they came out a little flat, as you can see in the picture below. These are a little better but still flat. Next time I will see what happens if I use 2 whole eggs in addition to my baking powder/soda adjustments. February’s recipe is going to be Dutch Crunch Demi-Baguettes (page 318). I will publish my results on February 26. Did you make the Banana Muffins or anything else from Bouchon Bakery? Let me know in the comments! For our next Peach Party entry, I turn to my favorite muffin recipe. I love this recipe because it is reliable, easy, and delicious. The muffins store and freeze very well. The crumb is so tender you might not guess they contain whole wheat flour! I don’t even have to make any adjustments for altitude. I usually make these with blueberries, but obviously this time I used peaches. This recipe comes from my favorite whole grain cookbook, King Arthur Flour’s Whole Grain Baking. Lightly grease a 12-cup muffin tin with cooking spray. Whisk together the flours, baking powder, baking soda, and salt; set aside. Cream together the butter and sugar in a large mixing bowl until light and fluffy. Scrape down the bowl. Add the eggs one at a time, beating well after each addition. Add the vanilla and sour cream; mix until incorporated. Add the dry ingredients and mix on low speed just until the batter is smooth. Scrape the sides and bottom of the bowl again to be sure everything is well combined. Gently fold in the peaches. Refrigerate the batter at least an hour. Preheat the oven to 400F. Scoop the batter into the prepared pan and sprinkle with the course sugar. Bake for 22 to 26 minutes, until a cake tester inserted in the center of a muffin comes out clean. Remove from the oven and cool the muffins in the pan for 5 minutes. Turn them out onto a rack to finish cooling.